“Succulents really confuse me,” my friend declared, causing me to laugh out loud unexpectedly. She had taken the clipping and stuck it in a glass of water, and brought it to work where I’m guessing she could watch over it more closely. Over time, the branch had grown a beautiful, elaborate root system, visible through the glass. It looked pretty sitting on her desk, a welcome distraction from all the piles of papers and books strewn about her work area. Her friend had encouraged her to plant the clipping, allowing the root system to establish a completely new plant. A few days later, I was sweeping the sidewalk along the side of the bungalow and accidentally broke off a few branches from a large potted succulent. I knew instantly that I had a new project on my hands. I brought the stems inside and began looking for something to store them in while I waited for them to (possibly) grow roots, creating a whole new plant. 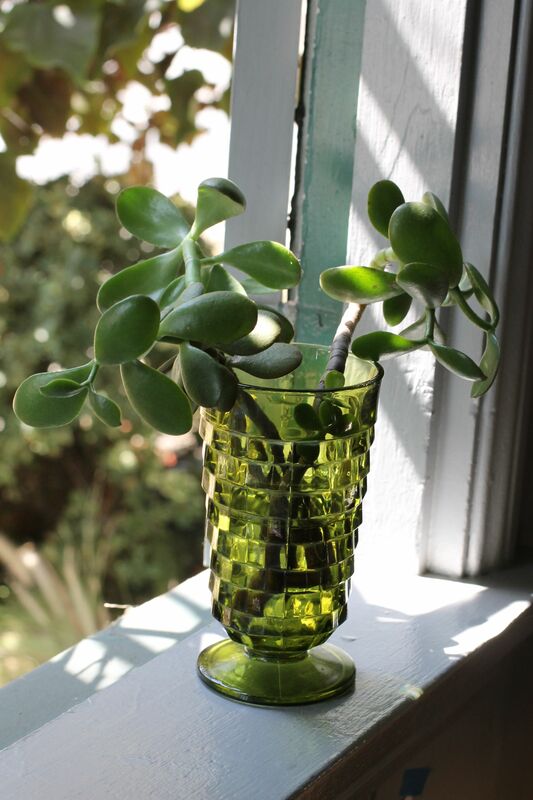 I found this beautiful footed goblet, its jeweled-green glass blending perfectly with the green hue of the leaves. I arranged the broken stems into the goblet and quickly found a resting place for it on the windowsill in my office. The succulent clippings have been there for over a week, still green and beautiful and happily soaking up the sun that comes through the window. I think I’ve noticed the tiniest, faintest hint of a root growing from the bottom of the stem. It could be real, or simply a product of my wishful thinking. Either way, I’m going to enjoy them for as long as they last. I love succulents and they’re relatively easy to grow. I do the same thing with indoor house plants.